The Russian Imperial Romanov family (Tsar Nicholas II, his wife Tsarina Alexandra and their five children Olga, Tatiana, Maria, Anastasia, and Alexei) and all those who chose to accompany them into imprisonment—notably Eugene Botkin, Anna Demidova, Alexei Trupp and Ivan Kharitonov—were shot, bayoneted and clubbed to death in Yekaterinburg on the night of 16-17 July 1918. 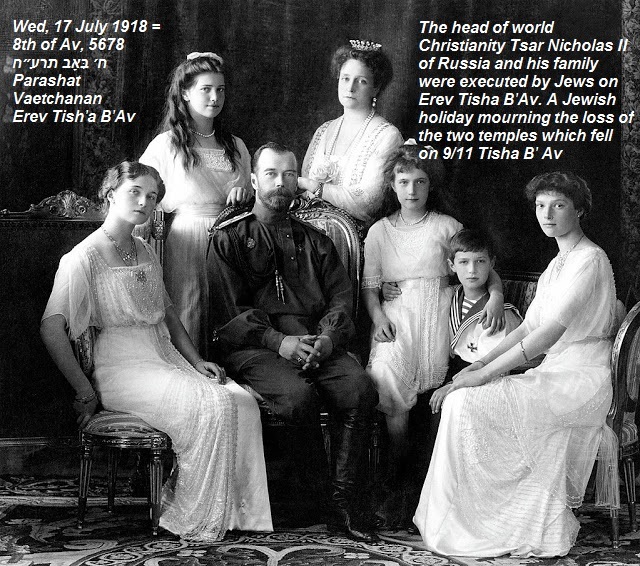 The Tsar and his family were killed by several Bolshevik troops including Peter Ermakov, and led by Yakov Yurovsky under the orders of the Ural Regional Soviet and according to instructions by Lenin, Yakov Sverdlov and Felix Dzerzhinsky. Their bodies were then stripped, mutilated, burned and disposed of in a field called Porosenkov Log in the Koptyaki forest. 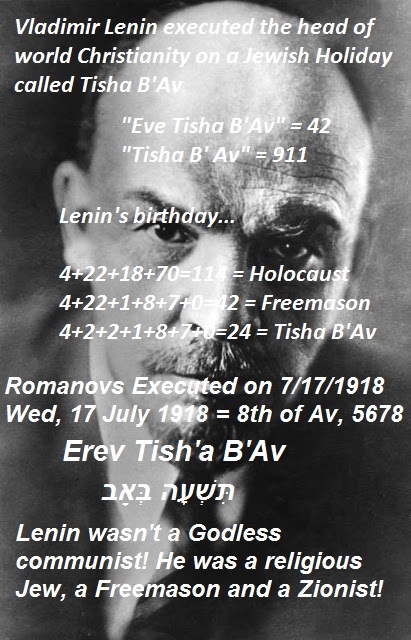 EXECUTED ON TISHA B'AV EVE ON ORDERS FROM JEWISH LENIN! If you spell the name with ff's their death death comes up. abdication of Tsar Nicholas II on March 15, 1917, as a result of the February Revolution. Nicholas II or Nikolai II Nikolai II Aleksandrovich; 18 May [O.S. 6 May] 1868 – 17 July 1918), known as Saint Nicholas II of Russia in the Russian Orthodox Church, was the last Emperor of Russia, ruling from 1 November 1894 until his forced abdication on 15 March 1917. His reign saw the fall of the Russian Empire from one of the foremost great powers of the world to economic and military collapse. He was given the nickname Nicholas the Bloody by his political adversaries due to the Khodynka Tragedy, anti-Semitic pogroms, Bloody Sunday, the violent suppression of the 1905 Russian Revolution, the executions of political opponents, and his perceived responsibility for the Russo-Japanese War. Soviet historians portray Nicholas as a weak and incompetent leader whose decisions led to military defeats and the deaths of millions of his subjects. Next Tuesday the 17th will be 100 years since they died. The Bank of England is 232 years old. Trump and Putin meeting is Monday 7/16 , 7/17 in Finland. "future revolutionary leader, V. I. Lenin (1870–1924) hid in Helsinki at the beginning of the 1900s, before the dramatic events of the October revolution"
HELSINKI — It’s time for Finland to bring its referee shirt out of storage: Donald Trump and Vladimir Putin are coming to town. The Finnish capital has been forced to snap out of summer vacation mode and fall back into its former role as a mediation point for world leaders as it prepares to host the U.S. and Russian presidents on Monday. The round-the-clock preparations are nothing new for a city that has long served as a meeting point for Moscow and Washington to resolve their differences: It hosted George H.W. Bush and Mikhail Gorbachev in 1990 to discuss Iraq’s invasion of Kuwait, as well as Bill Clinton and Boris Yeltsin in 1997 to discuss NATO enlargement and arms control. But perhaps the city’s most crowning diplomatic achievement was a 1975 summit that brought together the Soviet Union, the U.S., and 33 other countries to produce a framework to help stop the Cold War from turning hot. This good faith dialogue between adversaries was dubbed “the spirit of Helsinki,” and it still influences Finland’s foreign policy today. The "Bank of England" where Theresa May used to work is 232 years old this year. Just about to turn 324 a number I've been seeing a lot this year. They were executed in the town of Yekaterinburg Russia. God bless you kiddo! 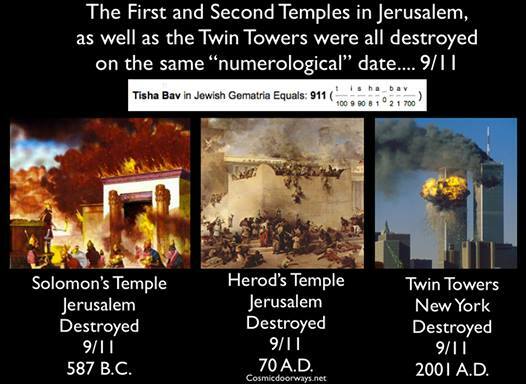 This was the last major house of (real) Semites, btw; House of Shem.